In my continuing quest for healthy recipes, I've been surfing some of our favourite recipe sites for low calorie meals. At the delicious. 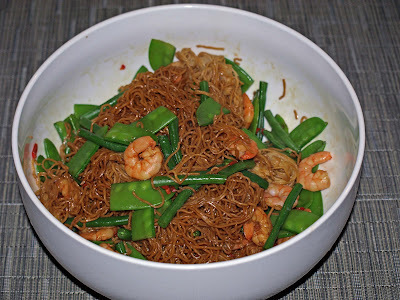 magazine website (UK version), I came across this recipe for Asian style noodles that not only sounded delicious and also came in at a measly 289 kcals per serving! I made it for dinner this week and it was a hit with both M and myself. Whoever said healthy food has to taste bad? Heat a dry frying pan over a medium-high heat. Add the sesame seeds and stir for 3-4 minutes, until lightly toasted. Transfer to a bowl and leave to cool. Whisk together the ingredients for the dressing. Bring a large pan of salted water to the boil. Meanwhile, top and tail the French beans and cut them in half lengthways. Cut the mangetout in half lengthways, too. Drop the beans into the pan and cook for 3 minutes, until just tender. Remove with a slotted spoon and refresh under cold water. Add the mangetout and cook for 2 minutes. Remove with a slotted spoon, then drain and refresh as before. Add the noodles to the pan and cook for 4 minutes or until just al dente. Drain and set aside to cool. Mix the beans, mangetout, noodles, prawns, most of the sesame seeds and the chilli together in a large bowl. Add the dressing and toss together well. Sprinkle wit the rest of the sesame seeds just before serving. wow! what a lovely ingredients for a bowl of noodle!